Members of Type O Negative have updated www.typeonegative.net with an official statement regarding the recent death of frontman Peter Steele. Ironically Peter had been enjoying a long period of sobriety and improved health and was imminently due to begin writing and recording new music for our follow up to “Dead Again” released in 2007. The official cause of death has yet to be determined pending autopsy results. The funeral services will be private and memorial services will be announced at a future date. We’d like to share our thoughts and those of Peter’s family below.We are truly saddened to lose our friend and appreciate the tremendous outpouring today from around the world. In a statement issued today by Steele’s family: “Legendary Goth/Heavy Metal musician Peter Steele died suddenly Wednesday, April 14, 2010, after a short illness at the age of 48. He wrote and orchestrated the music for the Brooklyn-based band Type O Negative, a groundbreaking group known for its dramatic lyrical emphasis on the themes of romance, depression, and death. Steele, renowned as much for his striking physical appearance as his musical talent, was the creative force behind the bands 20-year success writing most of the material for the their albums. Type O Negative and Steele have been lauded as a major influence by numerous alternative and metal bands. The band gained a worldwide following through touring and recording seven studio albums, two best-of compilations, concert DVDs and music videos. Their 1993 album “Bloody Kisses” went platinum, and the 1996 follow-up “October Rust” went gold. The music world has lost a great talent, and music fans worldwide are mourning, but for our family we are mourning a beloved brother, uncle, cousin, friend and funny man. 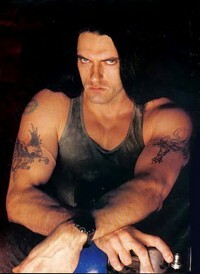 Peter Steele was a complex man, known for his brooding looks, his self-deprecating sense of humor, unique view of the world, and most of all his loyalty to his fans, friends and family. Survived by five sisters, the eldest living sister notes that he was more than our brother, he was our son. His untimely death is tragic — a great loss to us and to music. The official cause of death has yet to be determined pending autopsy results, and funeral plans at present remain unknown. The family thanks fans for their loyalty to Peter and band members, but request that fans and media respect their wishes for privacy.